All CANPEX OXY Barrier tubing is marked with the name CB Supplies as the manufacturer, nominal size, plastic tubing material designation code PEX 5006 (indicating that the PEX tubing has been tested and meets the F876 requirements for minimum chlorine resistance at the end use condition of 100% @140°F), design pressure and temperature ratings, relevant ASTM standards, manufacturing date and production code, as well as NSF-pw stamps (indicating third-party certification by NSF International for meeting and exceeding performance and toxicological standards, as well as achieving the highest chlorine resistance rating in the PEX industry). NSF conducts random on site inspections of the manufacturing facilities and independently tests CANPEX OXY Barrier tubing for compliance with physical, performance, and toxicological standards. CANPEX OXY Barrier is also certified to meet the Uniform Plumbing Code, NSF-61, NSF-14, NSF Annex G (Lead Free), CSA (Canadian Standards Association) B137.5 (cNSF), ULC/UL (Underwriters Laboratory) S101/UL263 and ULC S102 through Warnock Hersey. CANPEX™ OXY Barrier tubing is ideally suited for HRH applications. Its light weight and flexibility make installation of hydronic heat exchanger loops fast and easy. CB Supplies oxygen barrier tubing is used for hydronic applications where the total amount of oxygen ingress into the system must be limited. Its versatile design provides a solution for every project. Used in both residential and commercial construction projects, Vanguard’s radiant heating systems can be used as either a primary or secondary heating source for floor warming or as a snow or ice-melt system. For in-slab systems, CANPEX OXY tubing is simply attached directly to the reinforcement mesh. For under-floor (staple-up) and above-floor (suspended floor with or without poured topping) the tubing is attached to the flooring with tubing clamps or heat transfer plates. CANPEX OXY tubing is manufactured to nationally recognized industry standards: ASTM F876 and F877. 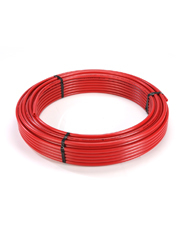 In the event the user wants to use some of the oxygen barrier pipe in a potable water system, CB Supplies CANPEX OXY Barrier is approved for conveyance of potable water. CANPEX OXY is available in 3/8″, 1/2″, 5/8″, 3/4″ and 1″ sizes. Common tubing sizes are 1/2″ for residential applications and 3/4″ for commercial and snow-melt systems. Supply/return transfer lines use the 3/4″ and 1″ sizes. CB Supplies warrants its Hydronic Radiant Heating tubing for 25 years, from the date of installation. You can be assured of the durability and reliability of CB Supplies tubing components in your hydronic radiant applications.